Creed offers a surprisingly daring depiction of the Rocky universe as seen from the other side of the tracks. A greater quantity of cinema than mere commerce required has made its way into Creed, a movie that resists its self-imposed destiny for a long time before settling down to being the black Rocky VII. All the landmarks of the franchise eventually fall into place, from the front steps of the Philadelphia Museum of Art to the crushable hat atop Mount Rocky itself, the folkishly wise noggin of Sylvester Stallone. 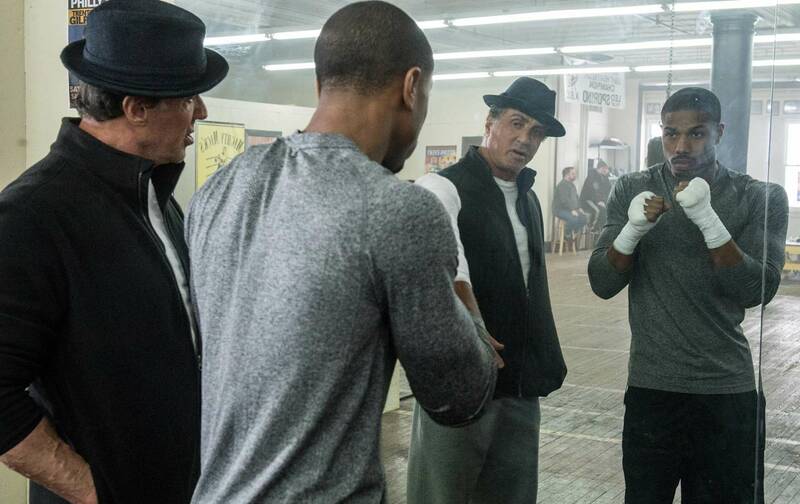 You wouldn’t expect ambition to flood these long-eroded narrative canyons; but then Creed has the distinction of being the first movie in the Rocky series not written by Stallone, as well as the second feature, after Fruitvale Station, to be directed by Ryan Coogler, a young African American with a serious case of Scorsese envy. He has found enablers: Irwin Winkler (who produced not only Rocky but several of Scorsese’s films), Maryse Alberti (a great cinematographer with her own ties to the master), and Michael B. Jordan, the endlessly resourceful star of Fruitvale Station, who was prepared to go the full De Niro in training for his new role. With the cooperation of these colleagues, Coogler has carried off some astonishing set pieces in Creed, including a two-round prizefight shot in a single, continuously mobile take. The scene would have been impressive had it been only a stunt; but like all true acts of cinema, it’s more. It demonstrates the ceaselessness of a boxer’s effort and courage in the ring, while confirming that Jordan’s physical achievements are real. The most fascinating aspect of Creed, though, is not this surplus of filmmaking but the central character. Working with co-­writer Aaron Covington, Coogler has conceived a story that focuses less on Rocky Balboa than on the newly invented Adonis Johnson, the unacknowledged son of Rocky’s original antagonist, Apollo Creed. Judging from the interviews Coogler has given, this appropriation of the Rocky characters and situations is in some measure a high-end exercise in fan fiction. When Coogler was a kid in Oakland, he apparently watched the Rocky movies over and over with his father. From these simple, visceral pleasures, shared in love, sprang the aspiration to make a Rocky picture of his own. But Coogler’s introduction to the series must have come in the early years of this century, which complicates the motive. How many new releases at the time featured black male characters with the power and flash of Apollo Creed? How keenly might a teenage Ryan Coogler have ached to fill that gap—maybe by taking over a white man’s franchise and retroactively making Carl Weathers, rather than Stallone, the hero? To do so would have been to change history. From their inception in 1976, the Rocky films projected an ascendant myth about privileged African Americans lording it over white ethnic workers who had nothing to show for their labor but their scars. To its credit, the franchise never developed this social hallucination into full-blown race hatred; by 1982, Rocky and Apollo were fast friends. But given the patriotic battle in Rocky IV against a monstrous Soviet fighter, and the contemporaneous spillover of Stallone’s persona into the figure of the poor, betrayed Vietnam War veteran John Rambo, the Rocky series became imagistically inseparable from Reaganism as an appeal to white Americans’ fears, resentments, and fantasies of omnipotence. Coogler can’t wish away this past or its ongoing bloody manifestations; but with considerable daring, he has commandeered the Rocky series to negotiate new symbolic terms for himself and other African Americans. It’s a project that turns out to entail some ambivalence. Coogler begins by making Adonis a neatly dressed professional man with access to his late father’s wealth; but he also strips Adonis of these advantages, giving him a backstory as an abandoned child in juvenile detention, plunking him down in a lonely inner-city apartment in Philadelphia, and making him insist (despite evidence to the contrary) that he’s always had to slug his way through life. Scratch the heir to yesterday’s pampered black star, and you’ll find a member of the present-day black bourgeoisie. Scratch the bourgeois in turn, and you’ll find someone else you never got to see in the old Rocky movies: one of the countless black victims of the American power structure. Crucially, Adonis is both a product of prisonlike state homes and a man born out of wedlock, one who bears his mother’s name and has never met his father. But blood runs deep in national mythology, and in the movie. Adonis’s inheritance in Creed is both an unacknowledged pool of capital (which frees him to quit his job and run, literally, with a ghetto crew) and also a genetic profile that somehow makes him a promising fighter. These complexities in Adonis’s identity, though striking, turn out to be a mere fraction of the conflicts that Coogler works into his character’s relationship to the exemplary white man, Rocky Balboa. After Adonis seeks out Rocky as a mentor, he comically blurts to his new girlfriend (Tessa Thompson) that this shambling old guy is his uncle. He chooses to move into Rocky’s house as if being adopted, blames Rocky for his father’s death (see Rocky IV), shouts angrily at Rocky that “we’re not a real family,” and then (amid one of the series’ frequent medical emergencies) decides it’s his duty to save Rocky’s life. Historical experience, as we know, has taught black people to take a more nuanced view of white people than whites tend to do of blacks. Coogler’s image of whites is practically kaleidoscopic in Creed, compared with Stallone’s monochromatic pinhole vision of blacks in the earlier Rocky pictures. And yet, after Coogler has given you so much more than you would have hoped for, he also gives you exactly what you’d anticipate. The climactic fight goes the full 12 rounds, as it must in Rocky films. Creed innovates—but not that much. There is no cinema at all in Adam McKay’s The Big Short, though here, too, there’s evidence of Scorsese envy. In this loose adaptation of the book by Michael Lewis, profiling a few scattered fund managers who noticed in 2005 that the housing market was riddled with fraud and likely to collapse, McKay has had the effrontery to call in the lead actress of The Wolf of Wall Street, Margot Robbie, for a narrative interruption in which she explains mortgage-backed securities to the audience while taking a bubble bath. It’s funny. It’s instructive. It also boasts, implicitly, that McKay is dramatizing the big story behind the 2008 financial collapse, rather than offering you Scorsese’s sideshow about a minor boiler-room operator. This is what you get when the director of the Anchorman movies decides to make a statement. Aspiring to move up in style, McKay abandons the serviceable point-and-shoot technique of his Will Ferrell comedies in favor of the presumed artfulness of unmotivated camera movements, jumpy close-ups, needlessly scrambled chronology, and random focus. For his principal mode of address, he chooses the lecture. Sometimes the method is jocular, as when Robbie or another passing celebrity like Anthony Bourdain or Selena Gomez delivers information out of nowhere. Sometimes it’s peripatetic, as when characters visit a convention in Las Vegas so that they can interview people and also, well, show you some Vegas. And sometimes the effect is hectoring, as when Brad Pitt, in the role of an independent trader, yells straight into the camera about the devastation that Wall Street is about to inflict on the American people. Say what you might against The Wolf of Wall Street, Scorsese would never stoop to telling the audience what to think about his story, nor would he ever be capable of making a hash of the screen. That said, I like The Big Short better than The Wolf of Wall Street. Crude, vulgar, and heartfelt, The Big Short has the messy vitality that comes only when filmmakers are convinced they really need to tell you something and are determined to entertain you so they’ll be sure you’re listening. By filmmakers, in this case, I include the principal actors, who fling themselves headlong into their roles: Christian Bale and Steve Carell as hedge-fund managers (one a Metallica enthusiast in a T-shirt and bare feet, the other a ranting moralist in perpetually wrinkled suits), and Ryan Gosling as an oily, jeering investment banker who doubles as the film’s narrator. One of the few quasi-subtleties of The Big Short is its portrayal of all these characters (and Brad Pitt’s independent trader) as utterly self-absorbed, each in his own way. They seldom treat a conversation, or another person, as anything more than an instrument. With mordant cleverness, McKay maneuvers you into rooting for these clear-sighted, truth-telling heroes: people who would barely recognize you as human, and whose success will be bought at the cost of your massive failure. For the sake of the hectic outrage that McKay practices and spreads throughout his cast, I’m willing to forgive everything shabby in The Big Short: the style, the hectoring, and even the wigs that are semaphori­cally plopped onto the actors’ heads. McKay couldn’t have foreseen the full effect of the wigs when he went into production, but those follicular extravagances now read as prescient warnings of the advent of President Trump. As the movie preaches, suckers are still being born every minute. This much is true: On October 7, 1944, the murders at Auschwitz-­Birkenau were interrupted by the almost barehanded revolt of two groups of Sonderkommandos—prisoners, most of them Jewish, who were forced on pain of death to usher new arrivals toward the gas chambers, bear away the corpses, and clean the ashes from the crematoria. In László Nemes’s new film Son of Saul, this much is fiction: In the midst of continual horror and unbearable moral agony, and with plans being whispered for tomorrow’s near-impossible revolt, one of the Sonderkommandos becomes obsessed with a single dead boy he has dragged from the gas chamber, insisting that he must find a rabbi and give the child a proper burial. Any fiction film set in the death camps will necessarily raise questions about sensationalism and exploitation, trivialization and pandering. In Son of Saul, though, Nemes has intensified the unease by adopting a radically intimate method of portraying his main character and Auschwitz-Birkenau: He keeps the camera almost continually in motion, tracking the Sonderkommando Saul (the nonprofessional actor Géza Röhrig) as single-mindedly as Saul pursues his self-imposed mission. No matter whether Saul is going about his nightmarish duties or, in search of a rabbi, venturing elsewhere through the camp at terrible risk, the camera stays on top of him. I have heard some critics dismiss the results of this approach as Holocaust: The Game—which is too cynical by half, and also too unobservant. Nemes actually practices a kind of double vision throughout the film, keeping Saul in focus as an object of study (more than as a point of view) while rendering his surroundings as a background blur. The only element of the film that seems immanent and immersive is the soundtrack. Nemes draws you in with noises that seem to come from all around, but at the same time he pushes you back, confronting you with two categories of the unrepresentable: the enormities of Auschwitz-Birkenau (which are mostly veiled from you by the limited field of vision) and the thoughts of the Sonderkommando (which are masked by Röhrig’s fierce yet impenetrable face). I did not feel that Nemes was inviting me to identify with Saul—which would have been an obscenity—but rather that he was making palpable the abyss that separates me from the Nazis’ victims. When Saul dares to move from place to place around Auschwitz-Birkenau, he nervily seizes a freedom that I, watching from my chair, am privileged simply to assume. When Saul seeks to pray over one boy in a place of industrial murder, he madly demands recognition of the value of individual life—a value that, again, is simply given to me. But I have no business taking these things for granted. Every day, like everyone else, I need to be awakened from complacency. Of the experiences that can ring the necessary alarm, Son of Saul is especially potent.